Before players are allowed to participate in the Little League Tournament each player must complete a Tournament Verification Form to verify the player's age and residence eligibility. A step-by-step checklist follows to help put together the Tournament Player Verification form and accompanying documents. 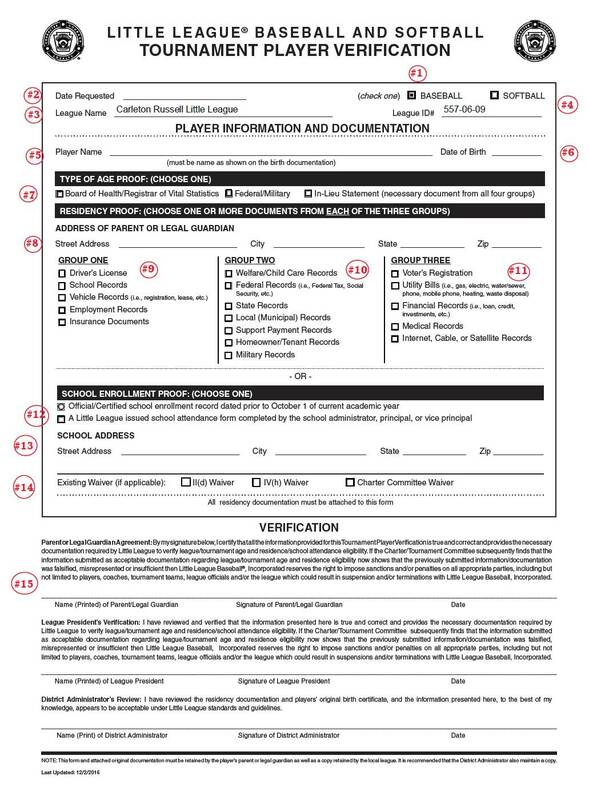 Please note that this form only needs to be filled out, and the documents collected, just *once* in a player's Little League career (unless the player's residence changes). So, do it correctly the first time and you should never have to do it again as long as the player continues to play in Little League each year. If you believe CRLL should have a valid verification form on file then please inform your team official. Player resides outside of the CRLL boundary but attends school within the CRLL Boundary - complete the school enrollment form and have it signed by a School official #10 of the checklist. (proof of address, #8 to 11 of the checklist, are not required). - II(D) waiver " previous CRLL player grandfathered to CRLL"
- a Charter Committee Waiver granted byLittle League International in exceptional circumstances. Note - it is preferred if the verification form can be filled out and signed electronically and then forwarded to your team or league official to preserve the electronic signature capability for senior league officials. Additional documents should be scanned and forwarded by email. Date requested: The day you are filling out or handing in the form. use full name as on birth certificate. Use format MM/DD/YY. This is requested by LL Canada so as to match the Tournament Affidavit. for Birth Certificate, check "Board of Health/Registrar of Vital Statistics". For the 2018 season, documents must have dates inside or overlapping the period Feb 1, 2017 to Jan 31, 2018. The closer to Jan 31, 2018, the better. Please feel free to black out account numbers and dollar figures. Make sure each document shows names, addresses and dates. If using this section, attach completed Little League School Enrollment Form. Birthdate should be in the form MM/DD/YYYY, not DD/MM/YYYY. Passports are *not* considered a valid proof of birthdate. No using more than one document in each Residency category. For example, you may use only one Utility bill. For example, you can use your electricity bill, or you can use your natural gas bill, but not both. No "doubling up" on Residency proofs. For example, if you have both your home phone and your Internet with same company, you can use that company's bill as a Utility bill or as an Internet bill, but not both.